When my friends and I were planning their holiday in my ‘hood, my friend N bluntly said, “I WANT MEAT.” N was on a long holiday with her relatives in Melbourne who have embraced this continent’s healthy eating lifestyle. While that is not a bad thing, I do understand how our inner food binger just wants to live a carnivore life. 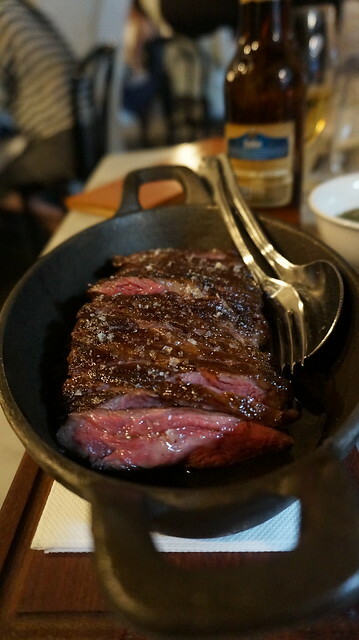 Hence, I suggested, “gaiz, let’s try this restaurant.” I attached a link to a No Reservations episode where Anthony Bourdain was eating some beautiful meat with Matt Moran in Surry Hills’ Porteno. 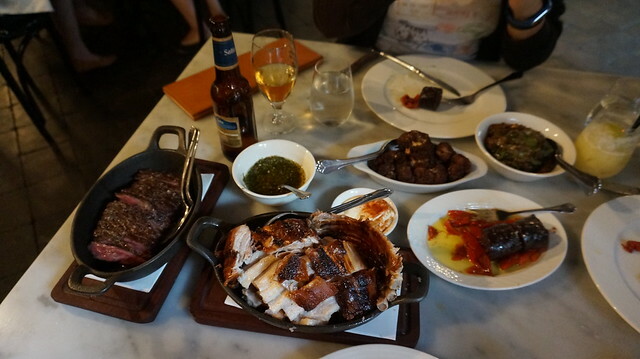 Ever since I saw Bourdain eat those spread of meats, I’ve always wanted to eat in Porteno. Those glistening meats on his plate looked too good to be true. I was immensely curious over a cooking and flavour profile I was not familiar with — Argentinian cuisine. In terms of Latin American grub, I was familiar with “Mexican” food, like Taco Bell and Chipotle fare. Argentinian food and flavours did not exist in my food imagination. However, after drooling over that segment, I dreamt of eating Argentinian food. 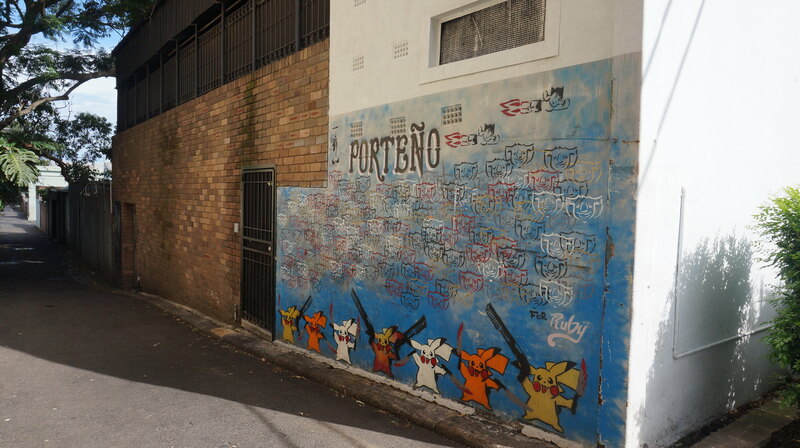 Porteno immediately became a part of my Australia bucket list. I have dreamt about lining up in this place on my own only to realise that their portions were never intended for one person. Hence, I plotted to visit this place with friends yet schedules, appetites, and its markedly uphill distance made a trip to Porteno something you’ve got to plan for. I tried to pitch it to friends and family who came over but day trips to Sydney were always exhausting that we would rather be on a train home than wait for our dinner. Hence, I sold my friends N and C on Porteno for their visit. These girls were responsible for kicking my trauma over Thai food so I felt like they were the perfect company for this meal. When you have friends who invite you on a plane ride for the best pad thai in Bangkok, you pretty much know you can drag them for a good meal. I’ve laid down all the deets on Porteno to my friends, from the distance to its price which might be out of their budget. But just like me they watched those meats grill on that No Reservations segment that in the end they were SOLD. Frack yeah, we’re finally eating at Porteno! So the girls and I plotted our Porteno day and we were fortunate even to have one of C’s friends to drive us around Sydney’s major spots, making us less tired. On the road, he was telling us that we have made a wise choice for dinner because Porteno was awesome. As he told his story of the his trip to Porteno, I was starting to feel less and less regretful about going there. Sure, there’s stories about people lining up but when I checked the website and saw that we can head there by 5, I thought that we have nothing to worry about it. Well, my anticipation got the best of me that my friends and I arrived there an hour earlier. An hour too early for our meal which we could already smell outside the restaurant. As we waited outside the door, we were tortured by the savoury scent of grilled meats. It was horrible yet wonderful. I couldn’t wait to eat in that restaurant and have whatever it was that I was smelling. Half an hour later, other people joined our misery. Minutes ’til opening, I felt my tummy protest, grumbling as loud as it could, begging to be fed. 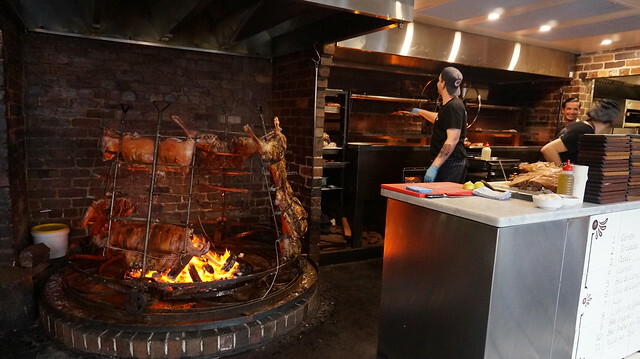 What caused our agony: Porteno’s pit roasting pork and lamb. As soon as we sat, the hunger became real. We were at a loss on what to order because our minds were just focused on those grilled meats. Thankfully, our waiter was nice enough to give us a guide on how to order. All the dishes were good for sharing. For a table of three, it’d be best to order two entrees, two mains, and two sides. Because my friends and I are nuts, we ordered one entree, three mains, and two sides. Again, without any remorse or regret. First up was mushrooms with burrata. When we ordered this, I had mistaken burrata for bottarga. I never had both before but I thought that buratta was the Italian cod roe with mushrooms. I was gravely mistaken as I realised that it was a nice oozy mozzarella. This dish was simply seasoned but the flavours of these two ingredients really shined through. 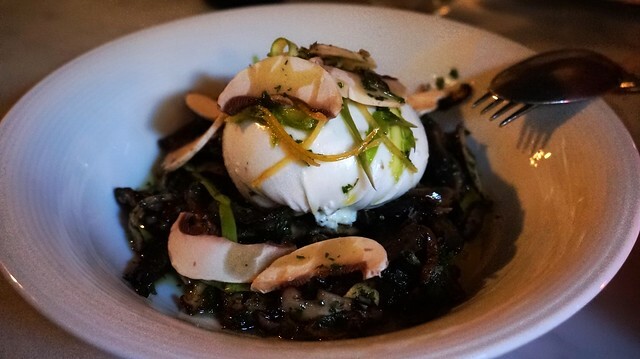 The earthiness of the mushroom against the cool creaminess of the buratta was heavenly. We were astounded by the dish and couldn’t wait to taste the rest. The first to arrive was this beauty. Soft, silky, and perfectly seasoned and cooked. I was amused that they did not ask us how we want our beef. I wonder if it’s partly the chef’s arrogance saying “there’s no other way you should have our meat but medium rare” or if this is just how things are in Australia. Or at least, in a hatted restaurant. Again, this ain’t a fancy dish. However, I finally understand what those Masterchef judges say when “you have to make things perfect when it’s a simple dish.” Possibly one of the best steaks I’ve tasted. With this was a chimichurri sauce which I realised was like the ‘ketchup’ of Argentinian meals. I’ve tried making chimichurri sauce at home although I wasn’t sure if it tasted right. Mine turned out to be close to Porteno’s so I was quite pleased that I did something right in this world. I think N and I were most eager to order Morcilla as she and I immediately agreed to order this. Personally, blood sausage is a curiosity for me. Filipinos have our fair share of blood dishes but seeing Bourdain go wax poetic over blood sausage, particularly THIS morcilla got me curious. Hence, for gastronomy, we gave it a shot. Surprisingly, it reminded me of a Filipino dish called bopis. 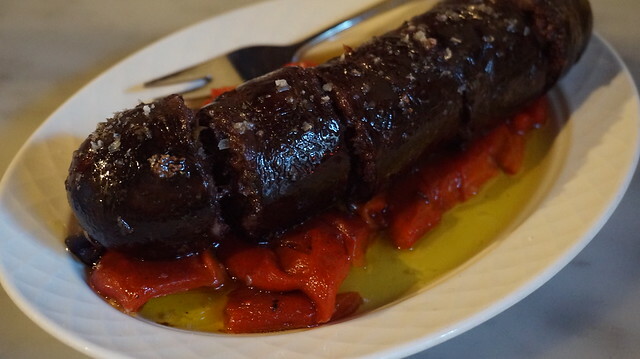 The Morcilla’s texture is surprisingly soft, closer to a chunky yet silky pate. In terms of flavor, it had a great amount of spices that melded beautifully with the gamey flavour of blood and other entrails. Yes, the morcilla was gamey. I was quite surprised they were not shy masking this bloody flavor. Then came this thing of beauty. This wood-roasted pork was just too good and too lovely. The skin was crisp. The meat was juicy. And OMG. It was such a beautiful thing. I honestly wanted to marry it, take it home, and say sweet nothings to it. The seasonings, as I remember so vividly, were simply of salt and pepper. Maybe some garlic. And maybe some olive oil. I realised that at this point, Porteno’s dishes were fairly simple yet their techniques took these meats to a different level. 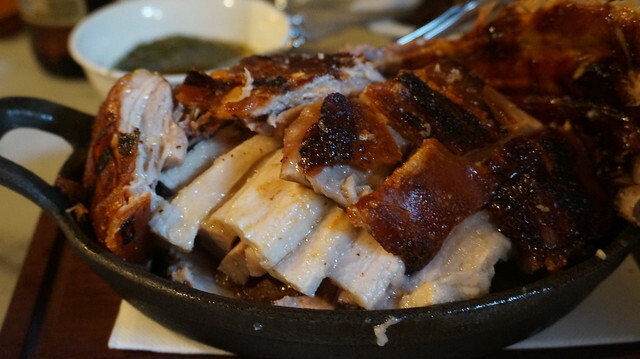 This roast pork, in particular, is my second favorite pork in the world. After Cebu Lechon, of course. Nothing beats Cebu Lechon for me. For now. Bless this lovely lovely meal. We also had two other sides: roasted cauliflower and lentils. The lentils were nutty and surprisingly sour. I think it’s meant to cleanse our palate after all that meat. The cauliflowers were a thing of beauty. Every time we took a bite of it, we can’t help but say, “WOW, I CANNOT BELIEVE THIS IS CAULIFLOWER.” I wish I knew how to make cauliflower that sweet and not as bland as I usually prepare it. It was too good to be real. After our cocktails, we found ourselves defeated by our meal, despite our hunger. We managed to take the pork home and I managed to say more sweet nothings to this blessed meat. In fact, for breakfast, I used the pork for fried rice and it was as bloody good. The pork and the chimichurri sauce just made everything better. Porteno was a fantastic meal and a humbling experience. Humbling because the dishes were all simple yet they were cooked to perfection. The ingredients were all treated with much respect and reverence that I can hear that Iron Chef judge saying “Porteno has made this pork, beef, mushrooms, and cauliflower, very happy.” It brought me back to our province where the ingredients are celebrated and respected. Ah~ this was such a glorious meal. Open on Tues-Sat. from 6 pm. Hyde Park noms and GAYTMs.